We’re recruiting an experienced GP to join a modern practice in outer suburbs of Hobart. The clinic is a purpose built centre which is well equipped and has a state of the art treatment room which is is equipped with all the latest diagnostic and therapeutic equipment. There are currently six doctors, full time nursing support, a practice manager and reception staff – all of whom are committed to providing quality care to their patients. Contracts are based on 38 – 40 hours per week and you must agree to have some part of your weekly roster participating in the clinics after-hours requirements (see hours above). To be considered for this position you must have MRCGP and CCT/PMETB or FRACGP/FACRRM or equivalent. Tasmania is a truly unique location. Australia’s southernmost state offers clean, white sandy beaches, forests of Huon Pine and massive tree ferns and pristine mountain lakes. Whether it is high culture, the arts and great music you are after or hiking, diving and fishing….Tassie has it all. With a temperate climate, it doesn’t suffer the wild fluctuations that other regions do. The summer nights are warm and mild and seem to stretch for ever staying light until after 9.30 pm in the summer. 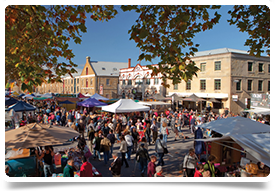 Hobart, the capital, is a very affordable city, easy to navigate and has a range of excellent schools to choose from along with a well-respected university. An international airport offers travel to most of Australia’s capitals and some regional centres too.